WINNIPEG – Since 2007 when for the first time June sales surpassed 1,500, this level has become the new benchmark upon which June is judged. At 1,509 MLS® unit sales in June, over 1,500 sales have occurred three times after 2007 including last year when there were 1,515 sales. There is only a 55 unit sales difference or over 3% higher sales activity in the record-setting June 2008. Not much difference on a year-to-date basis either. Year-to-date sales are running less than 1% ahead of last year with 6,502 sales. This total is only off 7% from 2007, which at the halfway mark and year end holds the highest unit sales level in WinnipegREALTORS® 112-year history. This reinforces why Winnipeg’s real estate market may lack the excitement of other housing markets because it’s so steady and stable in generating similar results every year. A byproduct of this stability is more affordable house prices. In RBC’s most recent housing affordability report which has been compiled since 1985 and-captures Manitoba’s proportion of pre-tax household income needed to service the costs of owning a home at market values , condos fared better with bungalows and two-storey homes going up marginally. In conclusion, RBC says “affordability measures remain remarkably close to long-term averages”. Sound familiar? Speaking of average house prices, they are very much in line with last year at the half-way mark of 2015. There is no breakout like this for condominium sales; however, the year-to-date average sale price of $241,029 is up over 1% from the same period in 2014. As indicated in the 2015 annual MLS® forecast, a plentiful listing supply will ensure well balanced market conditions prevail and therefore keep a lid on increasing house and condominium prices. 13,728 listings have been entered on the MLS® this year, an increase of 14% over 2014. Based on brisk sales activity in June, there is an inventory of approximately four months going into July. Reflecting how prices are being kept in check is the similar dollar volume this June compared to last June. Dollar volume eked out an ever so slight edge over 2014 (less than 1%) with a record-setting $416 million for this month and one of the highest monthly totals on record. Year-to-date dollar volume of nearly $1.8 billion is up less than 2% over the same period in 2014. It is the highest level on record for the first six months. Owing to a healthy supply of MLS® listings and historically low mortgage rates, buyers are continuing to capitalize on choice and rates or choice rates if the property they have long sought after is available for sale. Demand is holding up well too with one of the lowest unemployment rates in the country at 5.6 % and continued population growth fuelled by strong immigration. Manitoba’s real GDP is expected to grow 2.3% in 2015, making it the third best among provinces and above the national average of 1.8%. 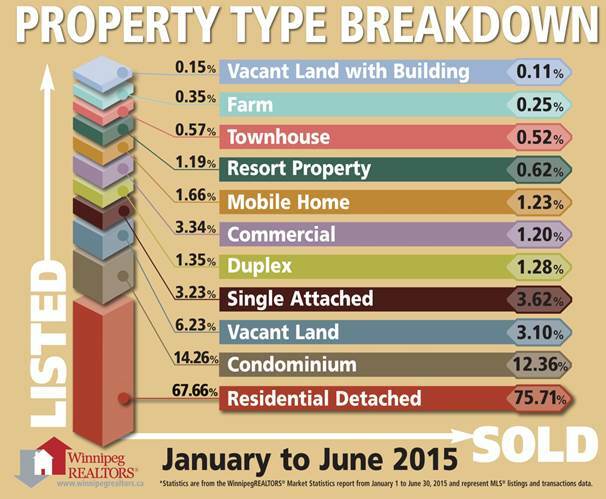 MLS® property type breakdown shows condominium sales in June were only down 6% in comparison to last June. This is a vast improvement over some earlier months such as February and April when they were well off last year’s sales activity. Year-to-date sales show residential-detached units up 5% while condominiums have decreased 15%. The most active price range in June for residential-detached sales was $250,000 – $299,999 (23% of sales), followed by the $200,000 – $249,999 range (15%) and the $300,000 – $349,999 range (15%). Another 22% of sales were split evenly in the $150,000 – $199,999 and the $350,000 – $399,999 ranges. Average days on market was 29 days, 4 days slower than June 2014. The highest priced residential-detached sale was $1,165,000 and the least expensive sale was $32,000. The most active price range for condos was $150,000 to $199,999 (35% of sales) followed by the $200,000 to $249,999 range (18%) and the $250,000 to $299,999 range (16%). Days on market for condos was 49 days, compared to 41 days last year with the highest priced condo selling for $655,000 and the lowest priced sale at $57,000.